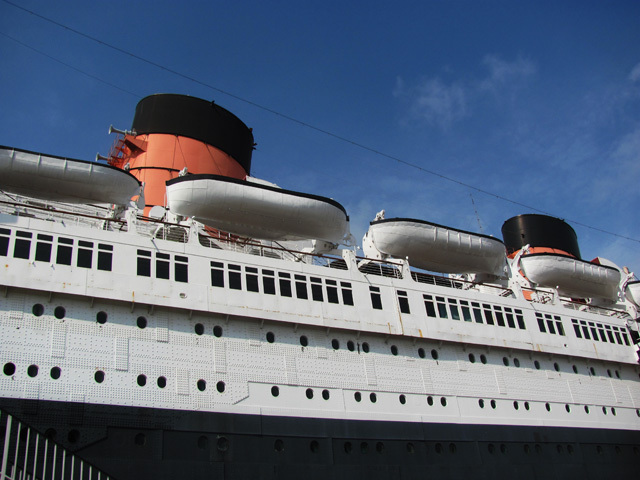 The first time I heard the horn blow on the Queen Mary, I was entranced. 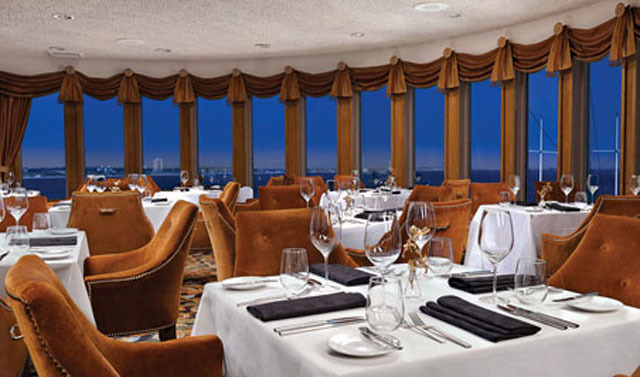 Kevin and I had arrived early for dinner and an overnight stay, and were sitting on the Promenade deck having a snack after our check-in. 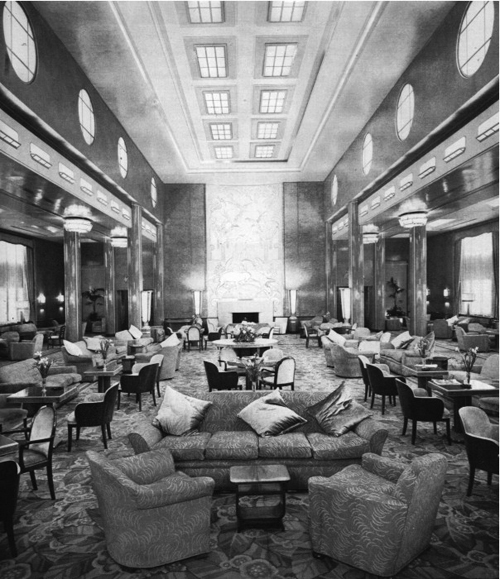 The cafe was filled with bright light, rows of tables pressed against windows with a view of the city, and the sound of clinking china as passengers softly chatted with one another through their meals. 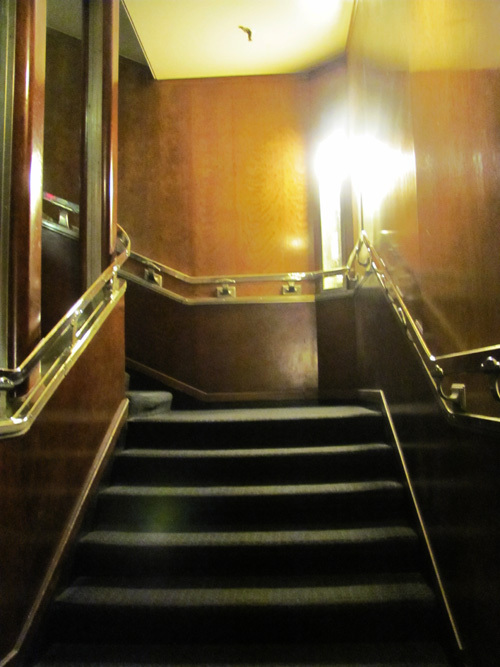 Suddenly, with a glass halfway to my lips, there it was...that strong, steady, and slightly mysterious moan that tended to shake the entire ship. 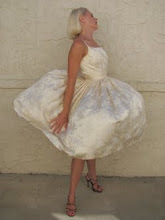 With the sound of that horn, I was instantly transported back in time to a more glamorous age. 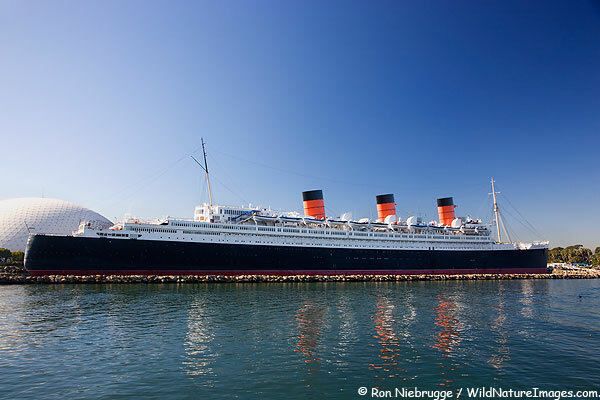 When it comes to the romance of travel, you cannot do much better than the mighty Queen Mary. 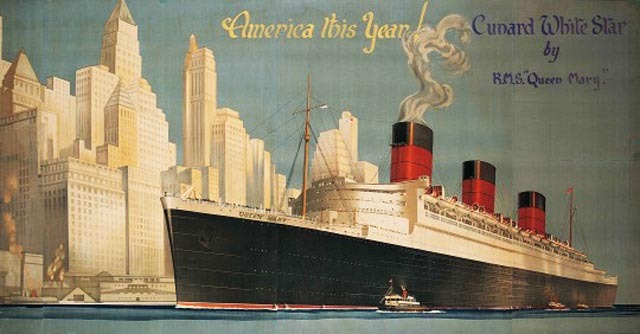 Built in the early 1930s, she was the proud flagship of Britain's famed Cunard line and built to be the largest and fastest ship of its time. 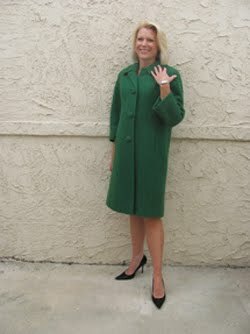 At 1,018 feet, she could stand taller than the Eiffel Tower and almost as high as the Empire State. 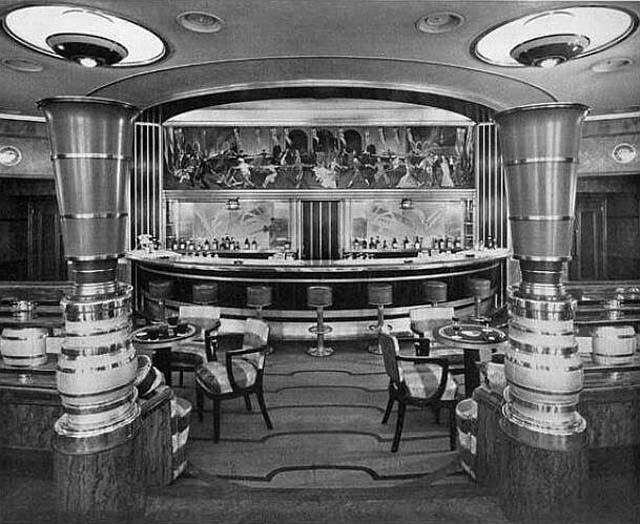 Much is made of her size and strength, but the Queen Mary was also the finest ship on the ocean--an Art Deco masterpiece--and considered the only civilized way to travel. Her detail is dramatic; wherever you look, exotic materials like ebony and zebra wood contrast against accents like ivory enamel and the shine of metal. 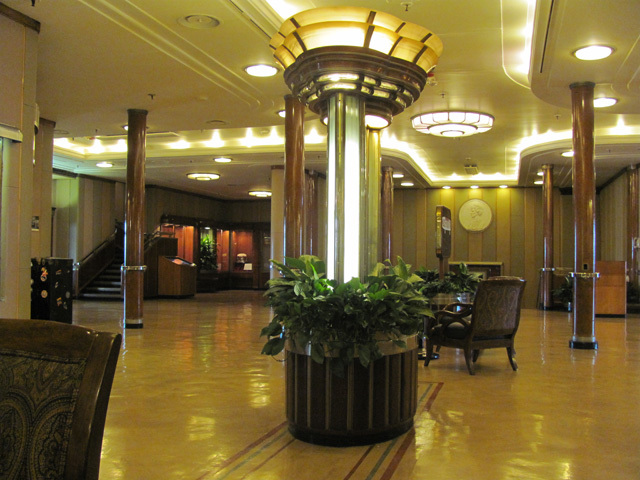 Though ships can often feel cold, the Queen Mary is warmed by many different kinds of wood like mahogany and maple. 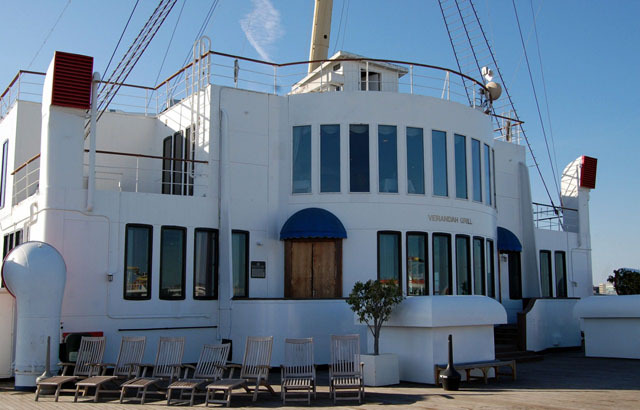 Rightly known as "the ship of beautiful woods" and an Art Deco icon, her beauty has been immortalized on film--everything from Dodsworth (1936) and The Lady Eve (1941) to L.A. Confidential (1997) and The Aviator (2004). 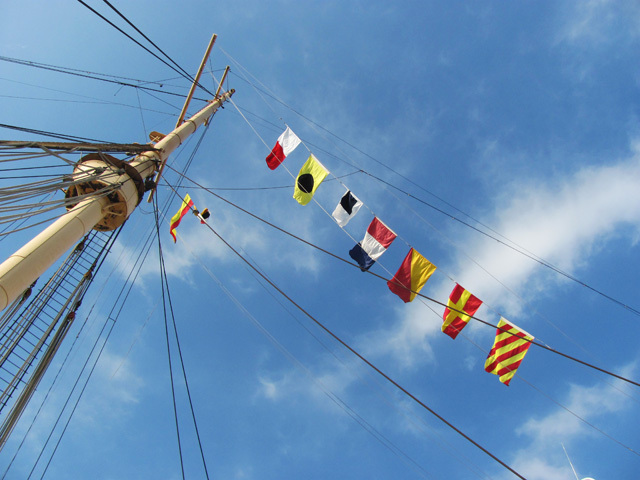 She has also been celebrated by many artists, such as author Evelyn Waugh in Brideshead Revisited and Poet Laureate John Masefield in his poem to celebrate her launch. 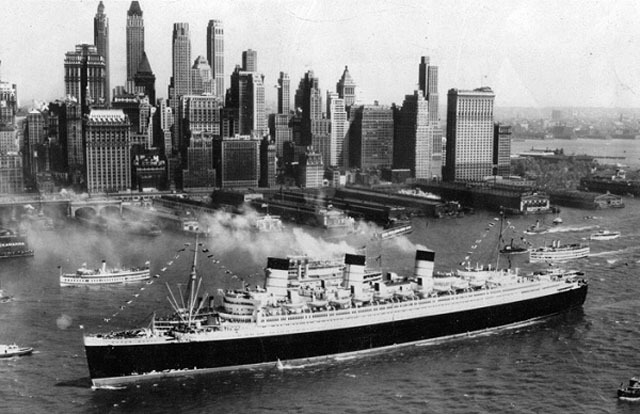 May 1936 marked the maiden voyage of the Queen Mary and she made her first trip in spectacular fashion. 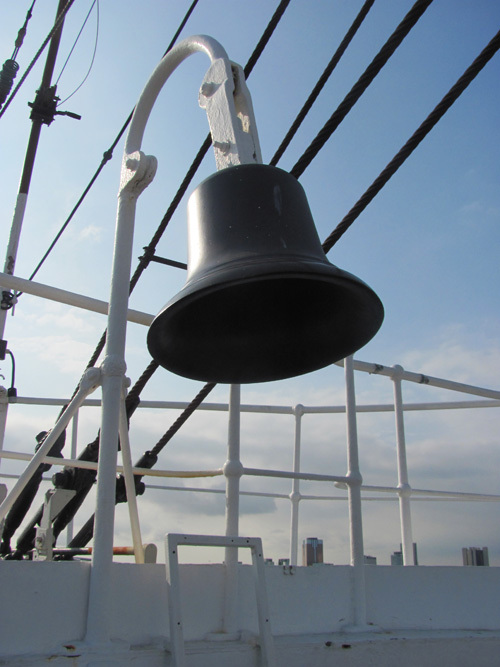 It all began with an inspection by King Edward VIII days before her launch. 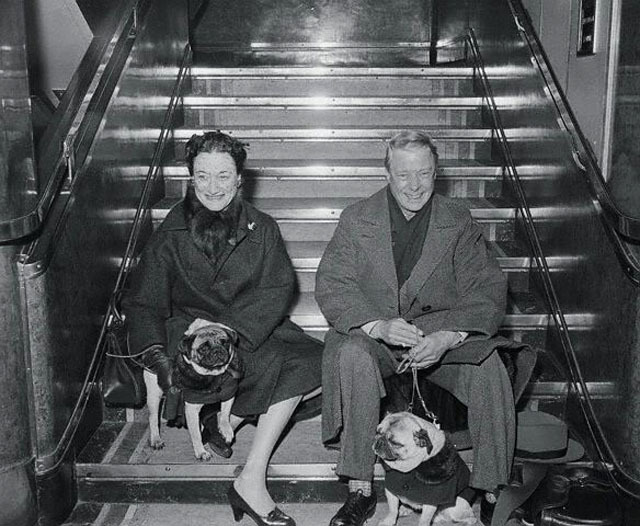 He would soon become a frequent passenger with his wife, Wallis, once he abdicated and they became the Duke and Duchess of Windsor. 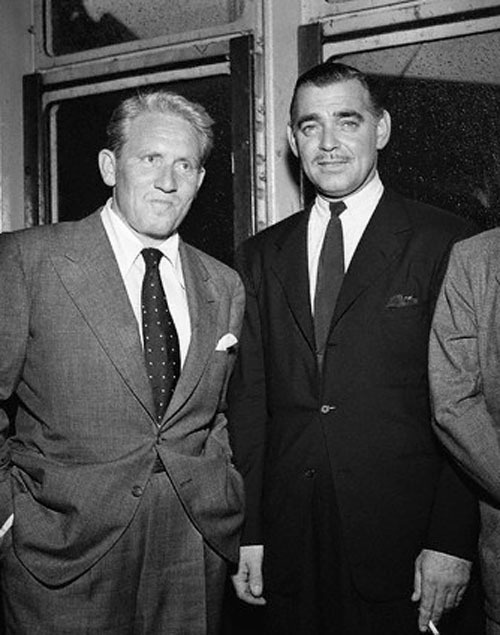 The Queen Mary also hosted royalty of a different kind. 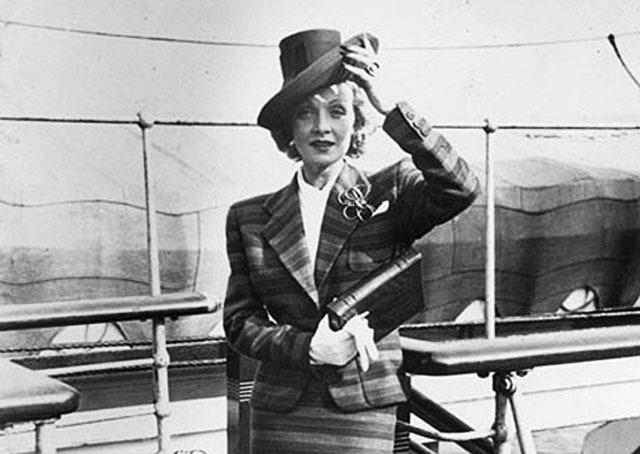 The stylish ship carried countless stars of Old Hollywood--Charlie Chaplin, Clark Gable, Douglas Fairbanks Jr., Marlene Dietrich, Gloria Swanson, Norma Shearer, and many many more. 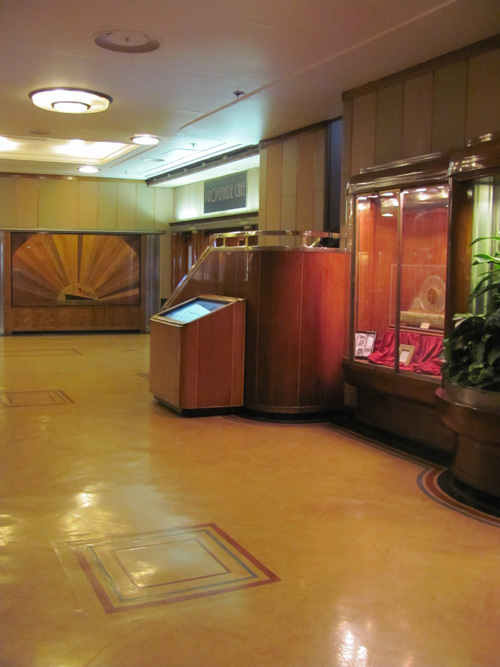 The Queen Mary was well-appointed and revered for her customer service, which is why each of her 2,000 passengers--whether traveling Cabin Class (1st class), Tourist Class (2nd class), or 3rd Class--thoroughly enjoyed their stay and experienced exactly why "getting there was half the fun." 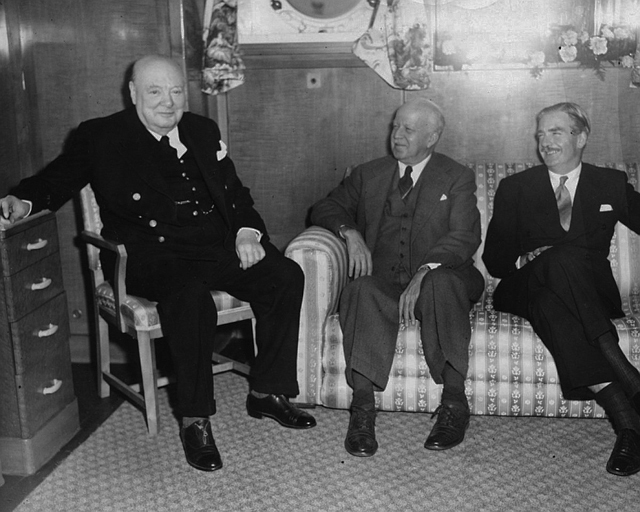 But by 1940, the world was at war. 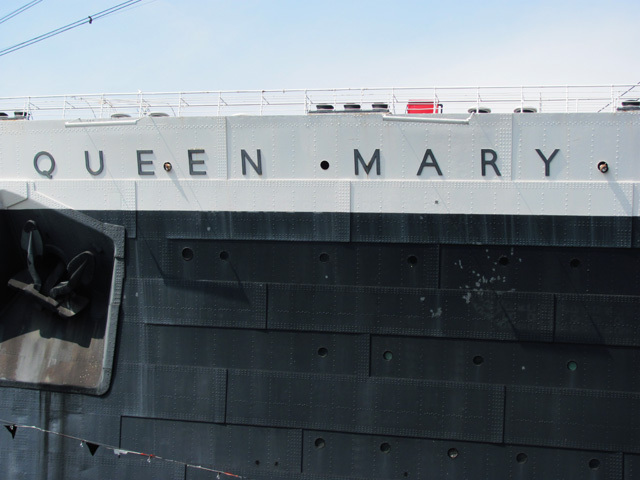 The Queen Mary was quickly requisitioned for military service and took on a very different persona. 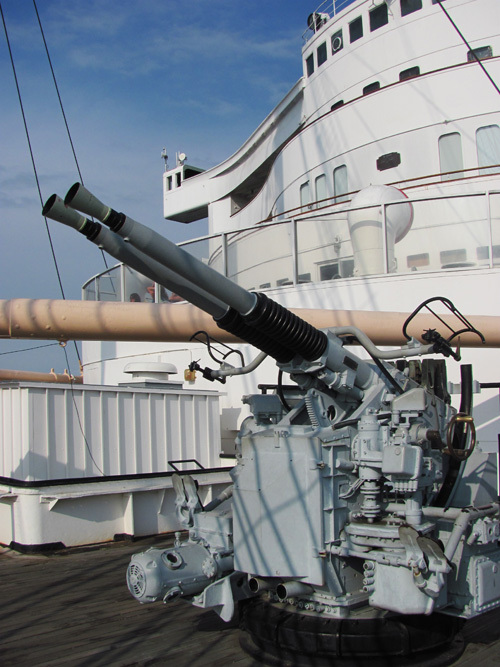 She was painted grey and nicknamed the 'Grey Ghost' because of her camouflage and ability to evade danger in the ocean. 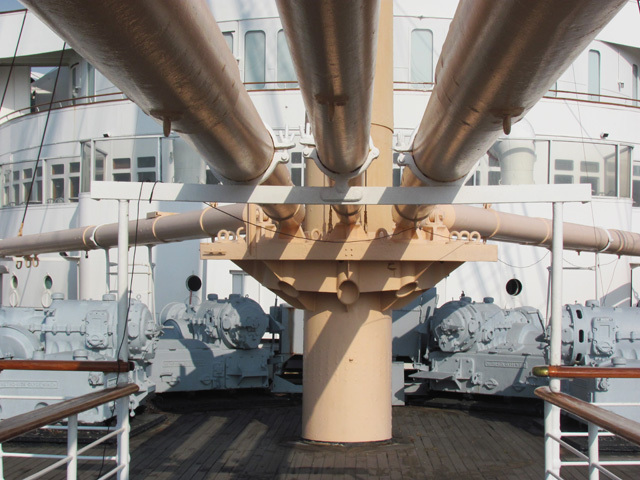 Her speed was her most effective weapon against the Nazis--moving at 34.5 mph, faster than most torpedoes--but she was also equipped with powerful defensive armaments. 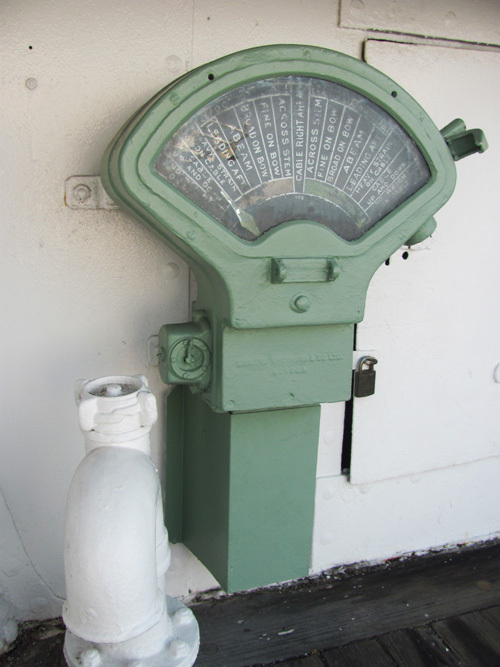 Some still remain on the ship today. 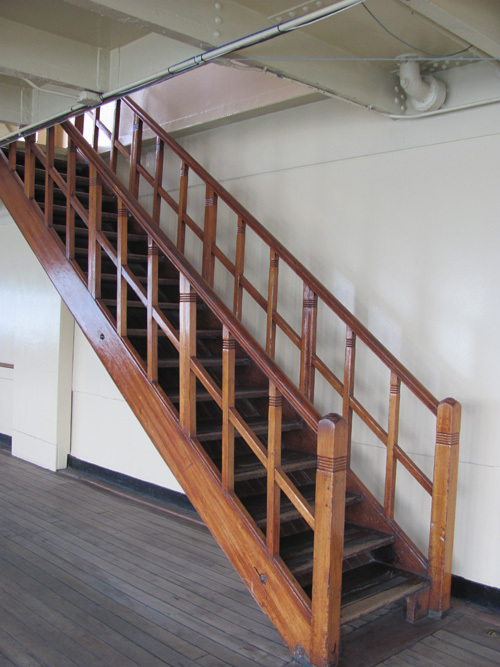 The Queen Mary's role was one of military transport, so interiors were refitted to accommodate 5,000 troops in one passage. 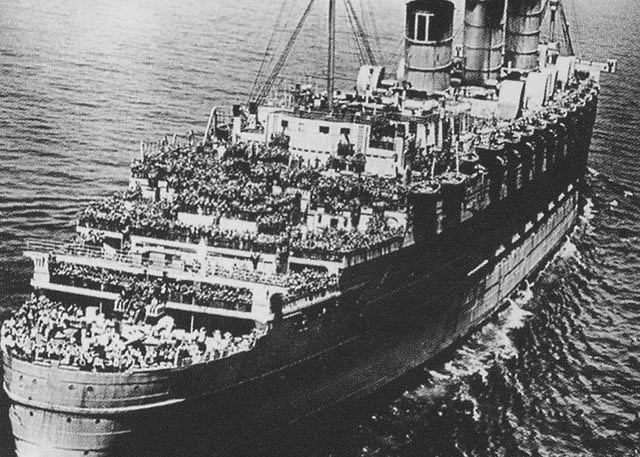 Though that number may sound high, she frequently carried more than 10,000 troops at a time. 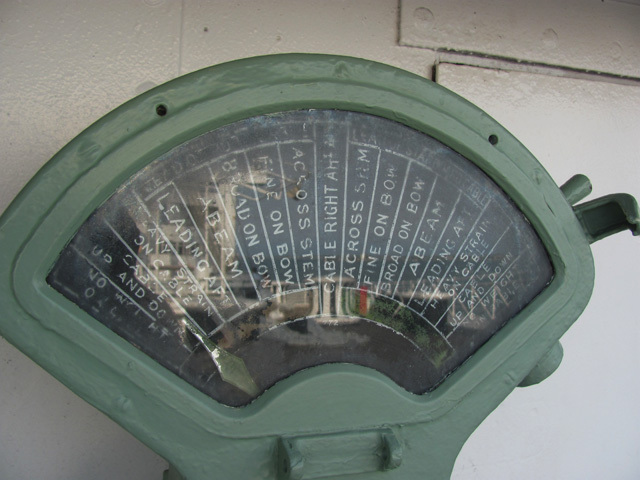 In fact, one trip with 16,683 passengers still holds the record for the most people on an ocean crossing. 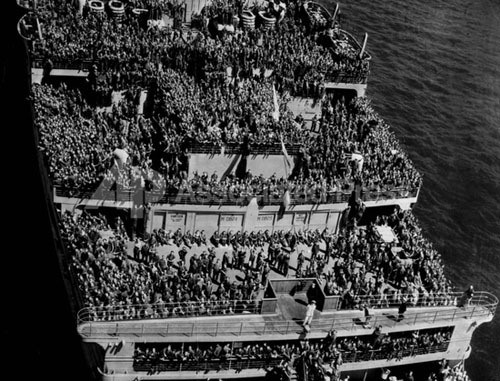 The Queen Mary's size and speed meant she could deliver an entire Division of soldiers across the Atlantic in only 5 days. 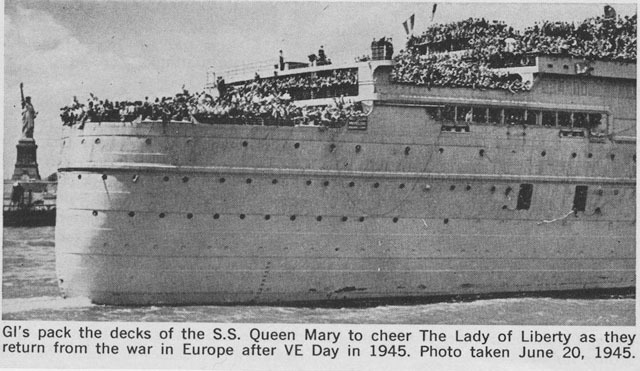 This was a feat that Prime Minister Winston Churchill, another frequent passenger of the Queen Mary, cited as a critical factor in shortening the war. 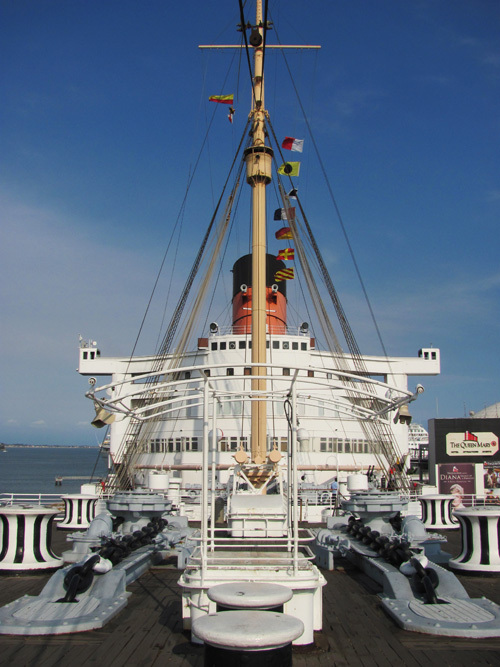 And once the war was through, the Queen Mary transported troops as well as their new wives and children--22,000 in all--back to the good ol' U. S. of A. 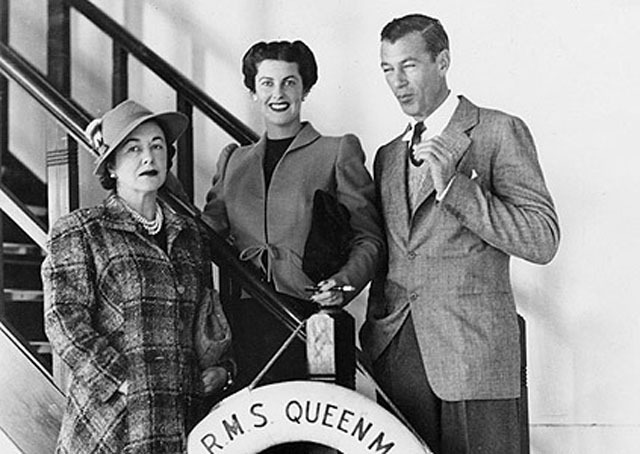 Though the 1930s are the years that many love to remember from the Queen Mary, 1947 to 1957 were actually her most popular and profitable. 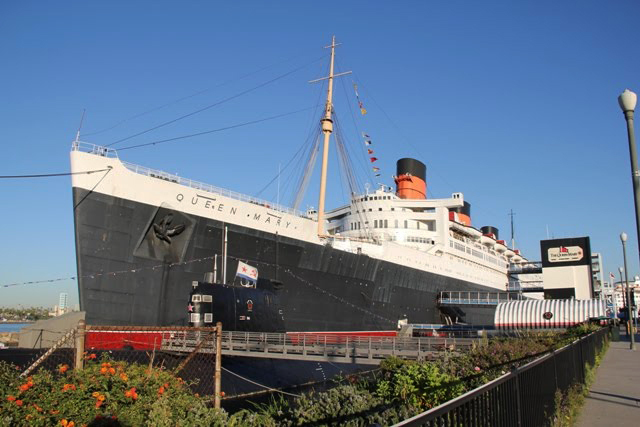 Air travel was still in its infancy at this time, so the Queen Mary (and her elegant sister ship, the Queen Elizabeth) were considered the "only way to cross" both for safety as well as luxury. 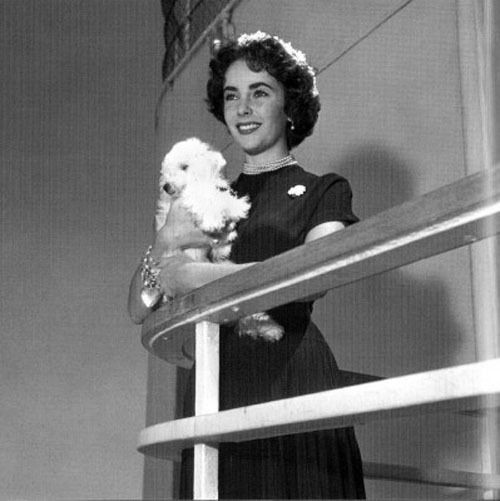 Success in peacetime was ensured by celebrities who continued to travel on her. 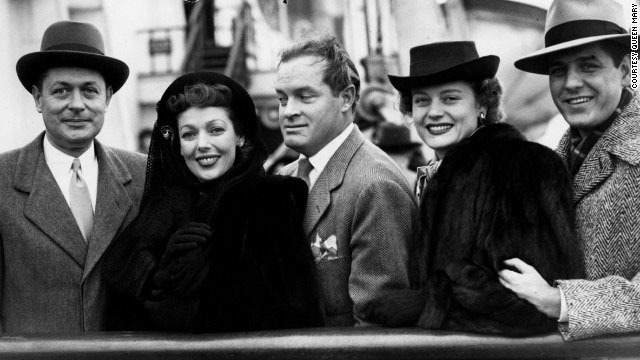 Clark Gable, Spencer Tracy, Bob Hope, Robert Montgomery, Loretta Young, Elizabeth Taylor, and Audrey Hepburn are just some who enjoyed the ship during this time. 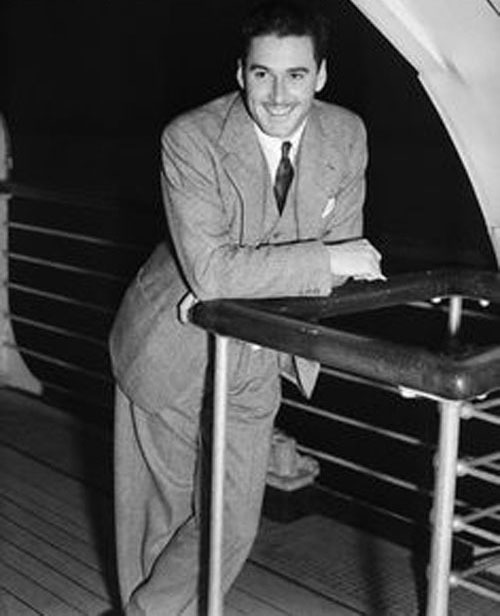 Hope even performed for passengers on stage aboard the Queen Mary during his voyages. 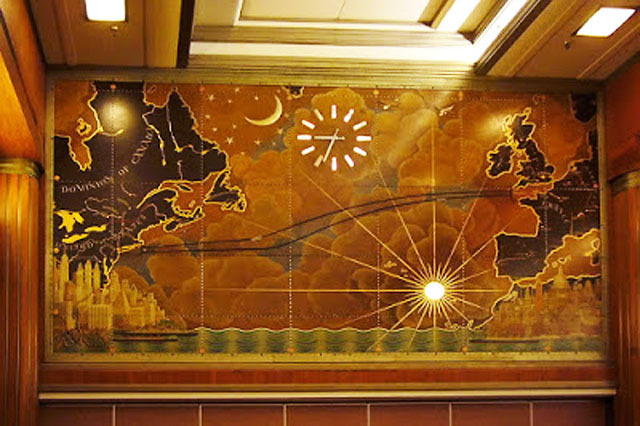 Finally, in 1967, after 31 years and 1,000 voyages, the Queen Mary was retired from the Cunard line. 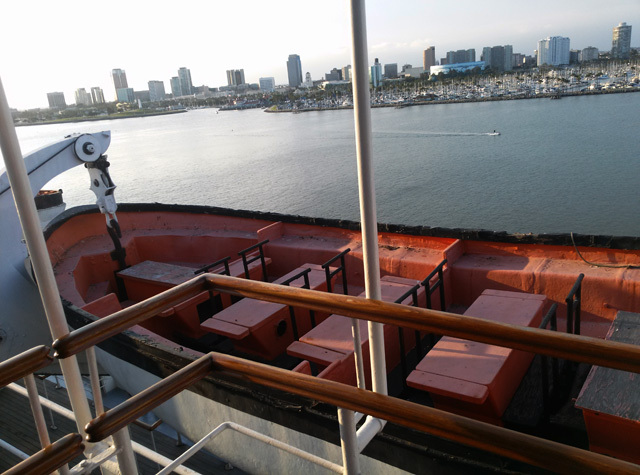 She set sail for the last time to her new home of Long Beach, California, which won the worldwide bid to keep her forever. 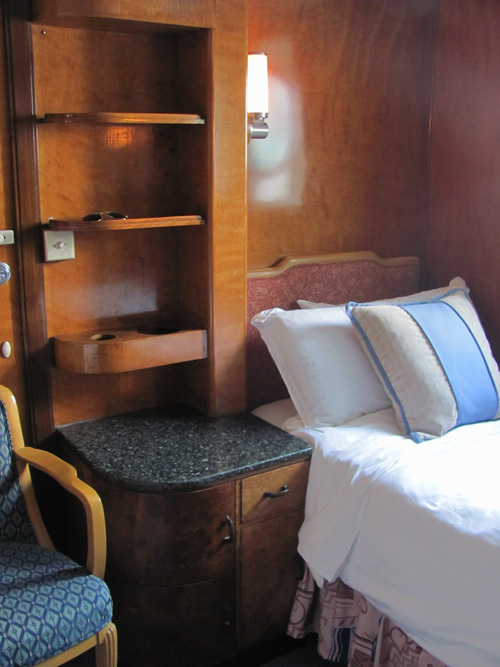 There she was restored, refitted with modern amenities, and re-opened as a hotel with a group of great restaurants. 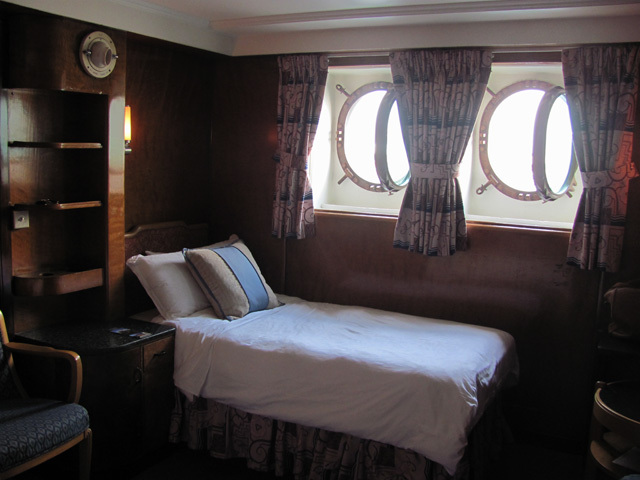 This is how Kevin and I came to be aboard her--first a dinner at the luxurious Sir Winston's restaurant (where we indulged in classic Beef Wellington) and then spending the night in a deluxe stateroom. You'll see some photos from our trip below. 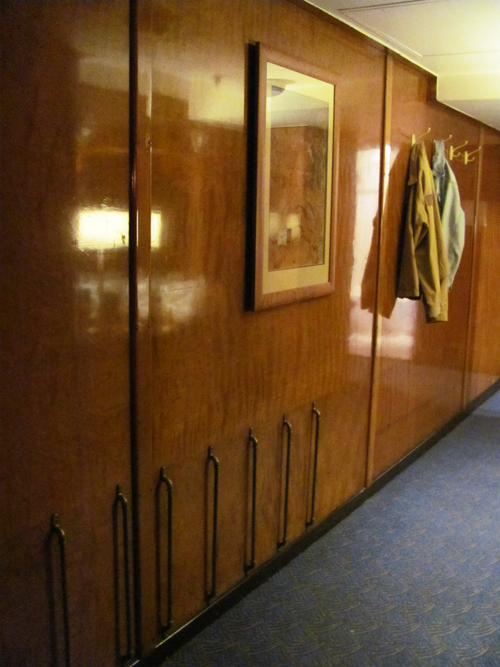 You sense every bit of history when you're on the Queen Mary. 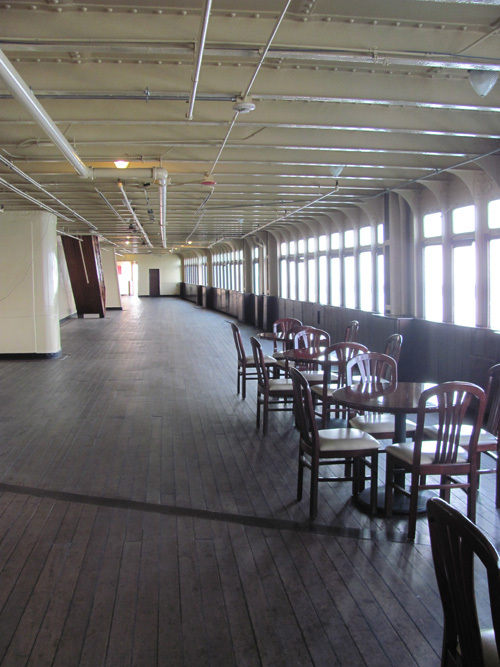 As you stroll on her upper deck, you can practically feel the ghosts of former passengers brush past you on the once busy Promenade. 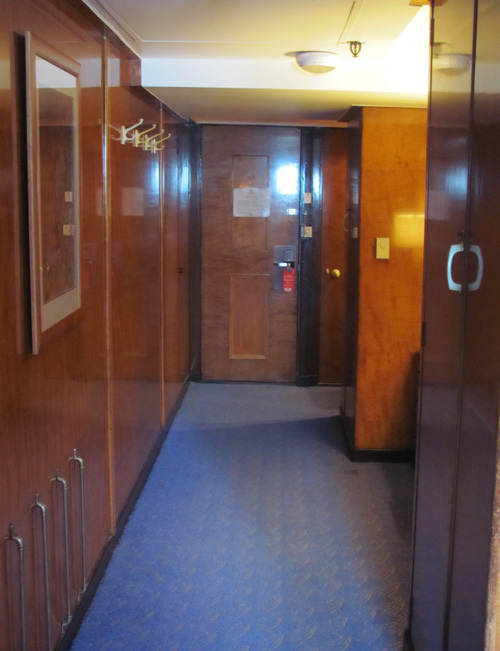 And everywhere you look is wood--from the floors to the walls, from the hallways to the staterooms. 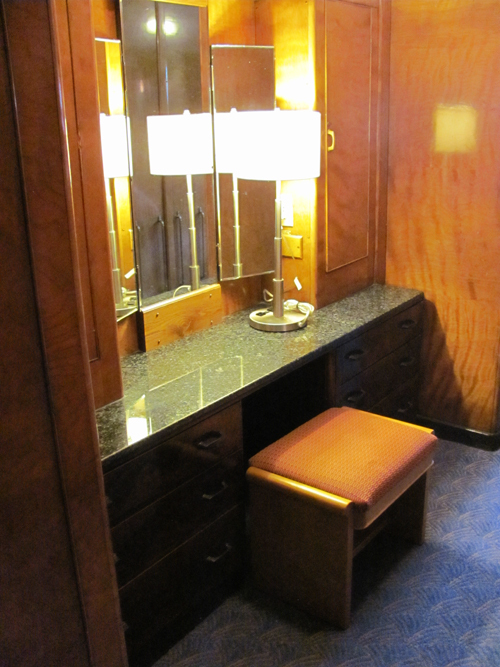 Our room was virtually frozen in time with beautiful marbled built-in furniture, including a vanity with a three-way beveled mirror. 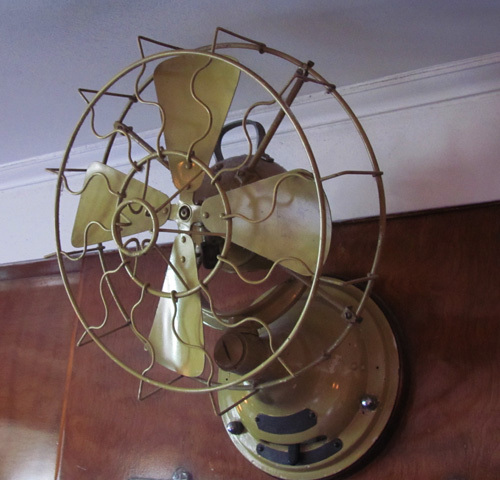 There were also original details that no longer worked but kept for decoration, such as the room's fan as well as faucets that offered warm or cold saltwater baths (once considered to promote good health). 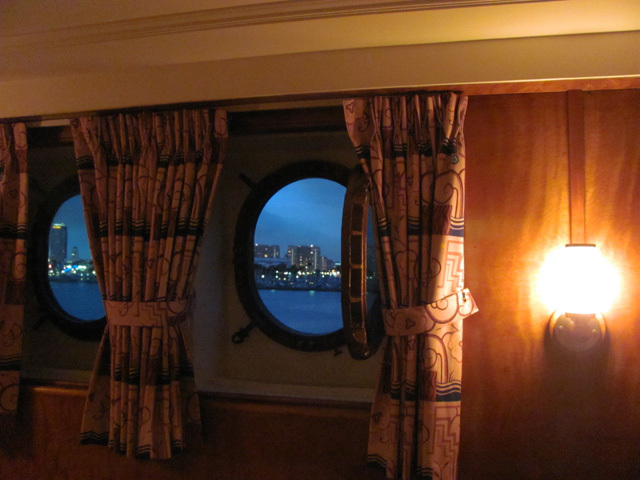 The portholes still opened, so we were able to smell the sea air and get an even better view of the harbor as the sun set. 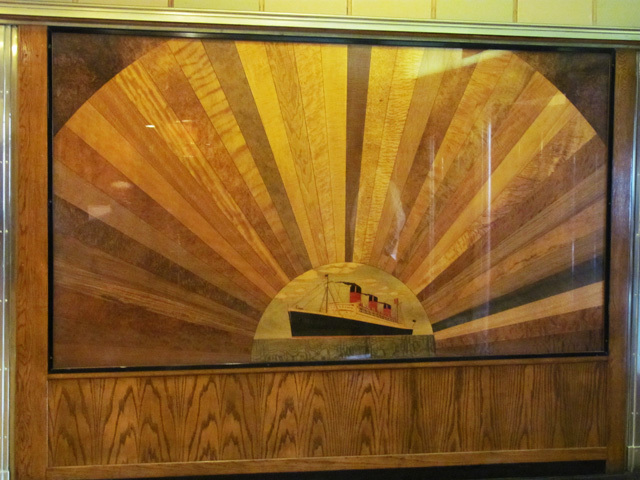 We were absolutely in awe of the Queen Mary's size and beauty. 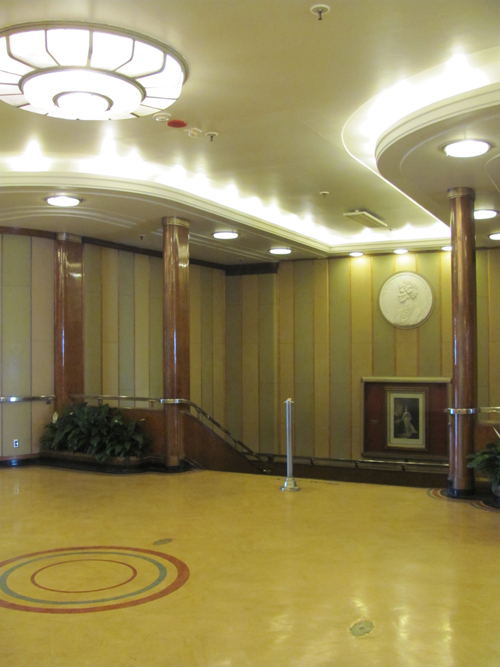 The entire ship is an experience in Art Deco elegance, and we already look forward to our next time to explore even more about her. 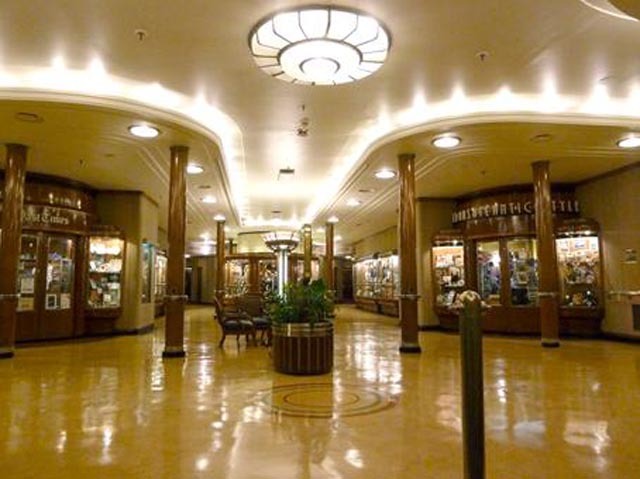 The Promenade deck's lobby near "Regent Street"
A great, very full, article with excellent photos! 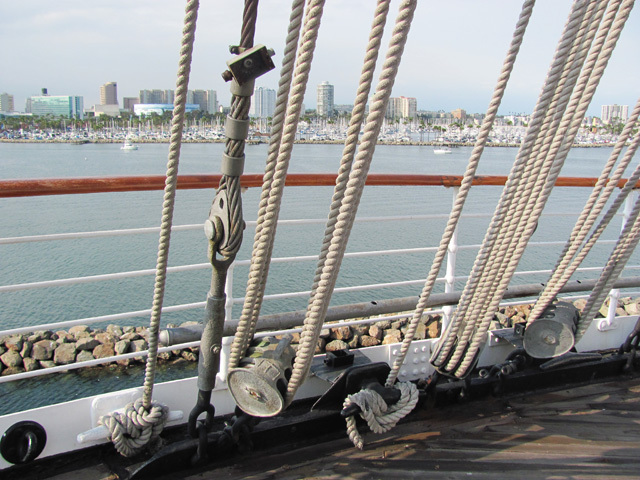 I agree with the previous commenter – the photos seem to do justice to this beautiful ship. Such incredible attention to detail. 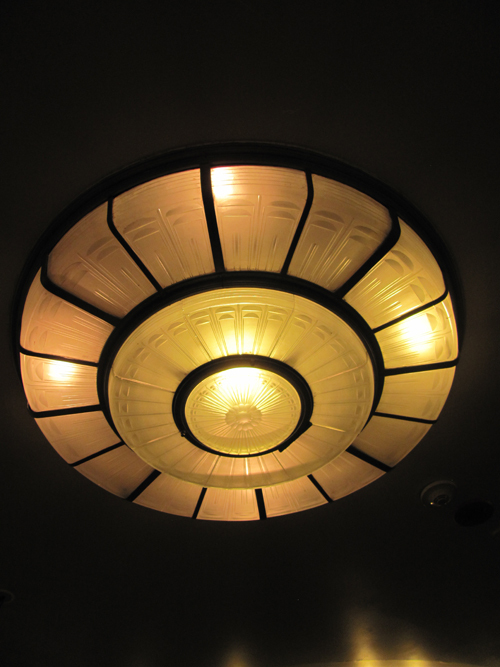 Your photos really show the incredibly lavish use of expensive materials,in Art Deco extravagance. 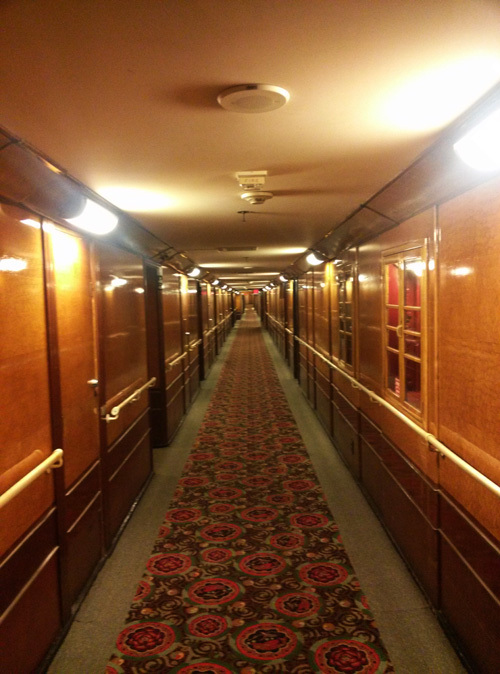 Love the long sleek lines of the ocean liners of this era, shown to great effect in the last picture. 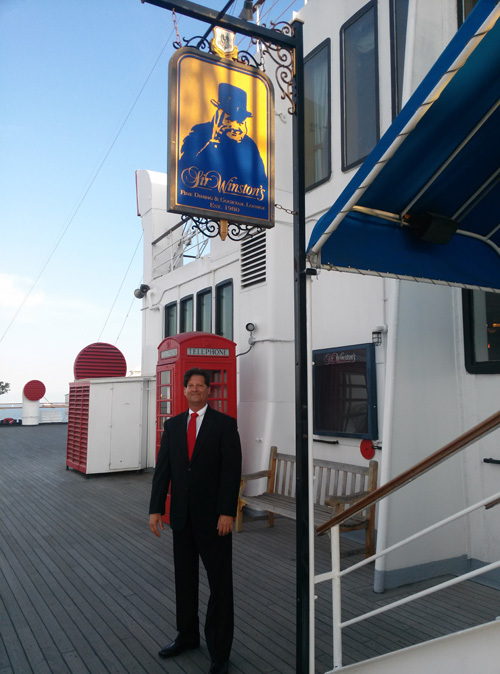 Thanks Howard! Aren't they all beautiful? 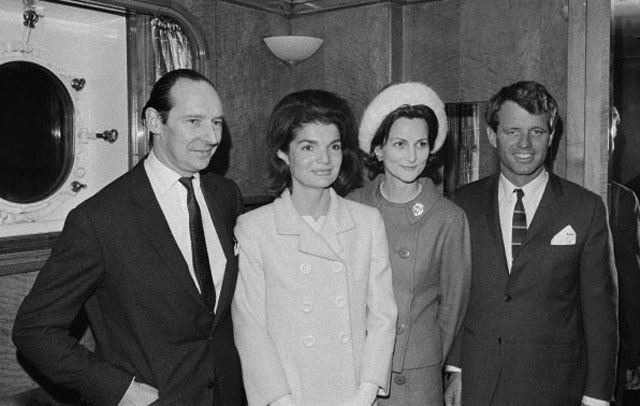 It was just extraordinary to see them all in person. 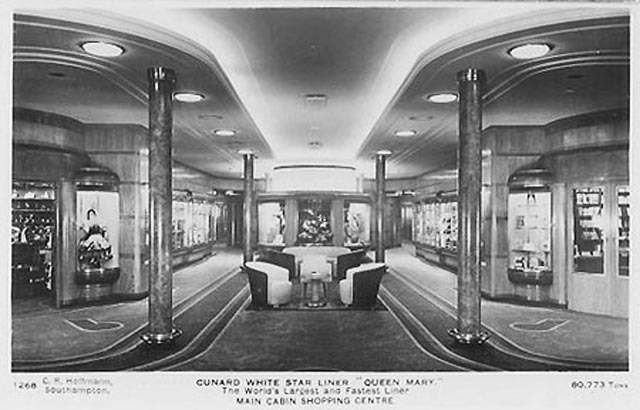 And I agree about the last photo--I just couldn't resist sharing it since it showed the Queen Mary's size as well as her lines, as you pointed out. 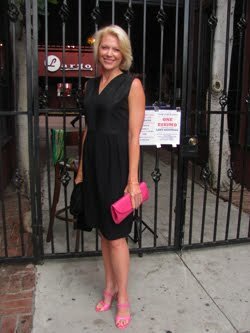 So happy you enjoyed the post! Thanks Kay! 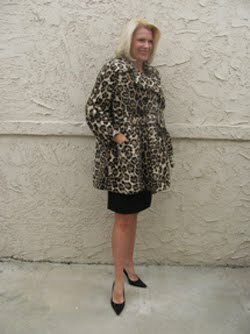 I though about you when we were there and KNEW you would go ga-ga for it. 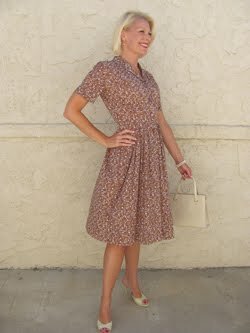 It's beautiful on its own and then when you add all the Hollywood history, it just pushes it over the top. 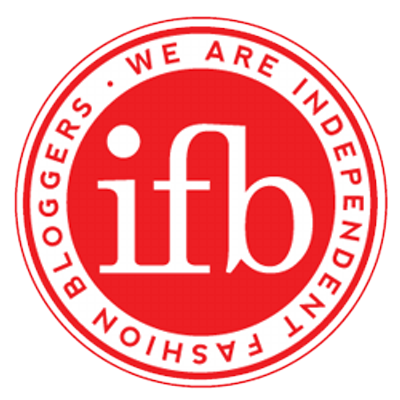 Really remarkable!